Repairing — Utility Supply (West) Corp.
Smith-Blair Cast Couplings include a versatile system of interchangeable coupling components designed to be lighter, with fewer parts, to reduce required inventories, minimize handling problems and improve installation time. 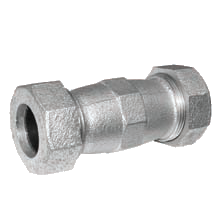 Smith-Blair Steel Couplings offer many distinct advantages when installed in a piping system. 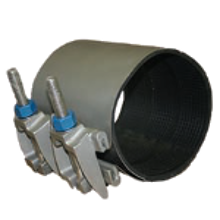 Properly selected and installed flexible couplings maintain the continuity of the pipe system, retain the line contents under internal pressure and prevent infiltration under vacuum. Our couplings consist of one cylindrical sleeve with conical inner surfaces at each end; two resilient, wedge-shaped, specially-compounded rubber gaskets; two ring-shaped followers and a set of high-strength, low-alloy track-head, oval-neck, rolled-thread bolts with heavy hex nuts. 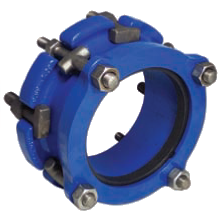 Smith-Blair Compression Couplings are designed to fit nominal pipe sized half-inch through two-inches. 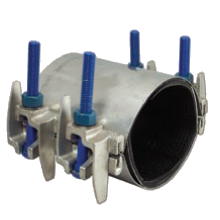 The Compression Coupling is designed to join plain-end small diameter pipe on new installations and pipe modifications. It can also be used to maintain and repair existing pipe systems. Smith-Blair Flanged Coupling Adapters (FCA) provide versatility on the job site by eliminating the need for a flanged spool. 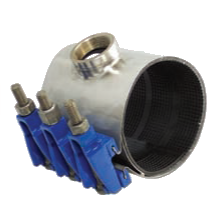 Our FCAs combine a flexible coupling and flange to create a compact fitting connecting plain-end pipe to flanged fittings, meters, valves or equipment. 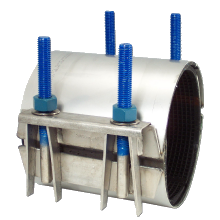 Smith-Blair Full Circle Repair Clamps consist of one or more stainless steel band sections to which cast or fabricated lugs are securely attached. 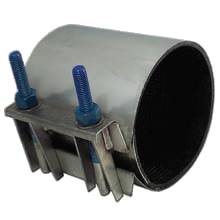 The lugs accommodate bolts and nuts when mounting the clamp on pipe. 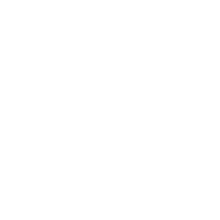 Full Circle Repair Clamps have a full encirclement, tapered, overlapping, gridded gasket with a flush mounted, bonded, stainless steel bridge plate to span the band opening between the lugs. This provides a full circumferential seal on the pipe. Smith-Blair Collar Leak Clamps have a full gasket with a double thickness of the same gasket material in one half of the clamp width. This step in the gasket material compensates for the differential in the outside diameter between the coupling or bell and provides a shoulder to compress against the end of the coupling or bell to form an effective seal. Smith-Blair 274 Bell Joint Leak Clamps provide a fast, economical means of sealing or preventing leaks in cast iron bell, and spigot caulked or rubber ring joints. 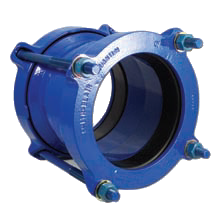 The design of the "Kee-Lok"® gaskets and Bell-Spigot rings enable a single clamp to fit both caulked and rubber ring joints on virtually all classes and brands of cast iron pipe in nominal sizes up to 36-inches. 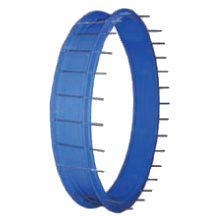 They are also suitable for use on AWWA C-900 PVC pipe thru 24-inches (longer bolts are required). Smith-Blair Redi-Clamps provide a fast, economical means of repair for pin holes, punctures, or splits in pipes.